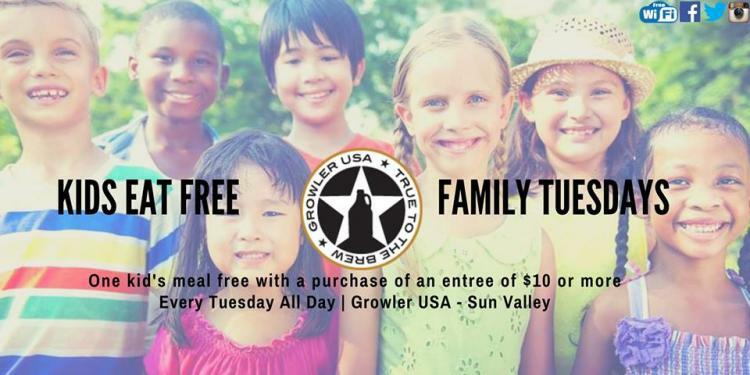 Come out and enjoy Growler with the whole family on our Family night. We are offering one free kids meal with the purchase of an adult entree of $10 or more. Why only the kiddos have fun? You can have it too! While the kids enjoy their free meal, indulge yourself with our Tuesday specials of $5 Two tacos (after 5pm, dine-in only), $4.50 NC local pints and $5 well drinks. Ask your server for restrictions. We are conveniently located inside Sun Valley Commons Shopping Center in Indian Trail with ample free parking.